Brighton’s only living sculpture, can be visited anytime from April 5th 2007 at St Peter’s Church, London Road on The Level - a short walk inland from the Pavilion. 'In Our Hands' was conceived in response to Brighton and Hove Arts Commission Eco-City in Bloom brief. The proposal for the creation and installation of this living sculpture was successfully selected in early 2006. This project is part of 'making a difference', a two-year cultural investment programme in Brighton and Hove, funded with lottery money through the Urban Cultural Programme. The commission forms part of the EcoBrighton element of the programme. The underlying aim of 'Eco-Brighton' has been to offer opportunities for artists to engage in ecological debate and to raise awareness of environmental issues. Detailed research and development work on the sculpture was begun in the spring of 2006. Specifics considered were construction methods and which plants would be suitable in terms of drought and air pollution tolerance, maintenance and aesthetics. A suitable peat-free compost mix also had to be found to meet the specific requirements of the brief. A scale model of the sculpture was made from clay and work was started on the constuction of the full-size framework during the summer. 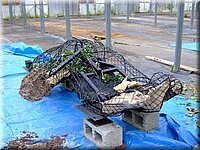 The long task of filling the three frames with compost began at Stanmer Nursery, just outside Brighton, with approximately three tons of soil used. The head, being the largest space to fill, was packed with a central core of recycled plant trays to fill out the volume with a light-weight material, thus reducing the amount of compost needed and keeping the overall weight to a minimum. - chosen as drought tolerant, ground covering plants. The rest of the head was planted with grasses and ivy to create the effect of hair. Once all the frames had been planted they were left to establish at the nursery over the winter, inside polytunnels.